It has been a long two weeks let me tell you. Today is the first day I've spent longer than an hour (not including sleeping) in the apartment. It is so nice to get caught up on things. I'm doing copious amounts of laundry and looking forward to actually cooking a nice healthy meal. Everything is coming along at a rapid rate. Currently my husband is at the house base and casing the last two bedrooms and master bathroom and then….we are ready for paint! My husbands parents came to help for a whole week (we also took that week off work) and it was amazing!! They were such a HUGE help, without them I don't think we would be even finished laying the hardwood. Renovations are not for everyone! This "day off" from renovating couldn't have come sooner, I still love our house but I don't like it right now. I've spent too much time working there and I'm burnt out. But I am SO happy with the progress!! I couldn't get my husband to move out of some of these photos, apparently actually working is more important than documenting the work so excuse his head. I am so excited for everything that has happened. We put down floor protection as we were hardwooding the main floor so I haven't even be able to see what it looks like, it will make the reveal that much more exciting. We had leftover hardwood from the main floor so we decided to hardwood the master, I've always wanted hardwood in my master so I am so pleased. We've only had one real hiccup, our sink is backordered. It was supposed to arrive last Monday and we haven't heard anything. We can't have our quartz countertop measured until we get the sink because they need it to ensure a perfect fit. And it takes about two weeks to get the countertop after its been measured so hopefully it comes soon. 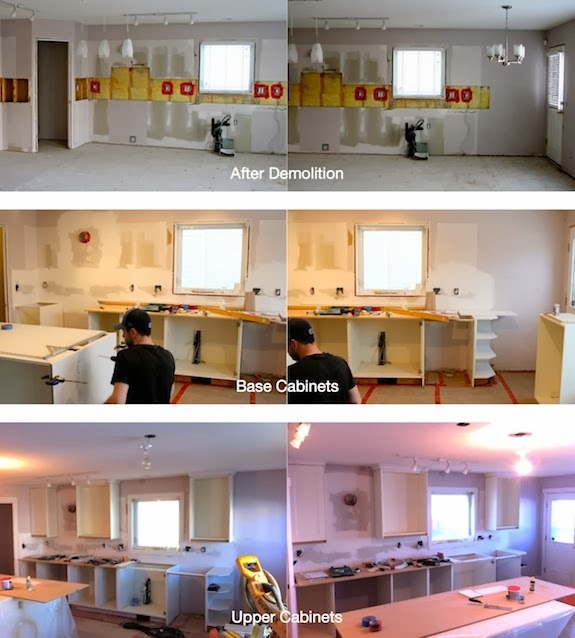 - All cabinets installed (minus the appliance garage because we need to countertop install before we can do that) as well as cover panels etc. This next week will be about finishing up base and case, filling nail holes/sanding and then cleaning. We need it to be spotless for the painters and then next next week the painters will come in a spray all our base and case, valences, crown moulding and cookbook shelf. After that they'll roll the walls and we will be rid of the purple palace forever.